Stadiums are demanding environments for WiFi. They're filled with people using Instagram, Facebook, Twitter, FaceTime, texting, e-mail and web browsing. New England Patriots coach Bill Belichick is a devoted Snapface user. All this activity can bring a stadium WiFi network to its knees. To meet those needs Extreme Networks Inc. (Nasdaq: EXTR) announced six new WiFi 6 access points (APs) this week that the company is calling "stadium-caliber" -- designed for sports stadiums and other demanding environments. Extreme excels in this area, and is currently deployed in about half of the NFL's stadiums, as well as some NHL and NBA arenas. I've interviewed NFL stadium executives about the importance of ensuring WiFi works all the time, regardless of how full the stadium is. Teams want the traffic on their own WiFi networks, rather than carrier cellular, so the teams can understand activity to make better decisions around ads, use of social channels to connect with fans, etc. If WiFi is poor, fans will shut it off and use the cellular network. Some stadiums incentivize fans to use stadium WiFi by offering benefits such as the ability to order food through an app or viewing replays through proprietary camera angles. Gillette Stadium, home of five-time Super Bowl champions the New England Patriots, was Extreme's first stadium win. So the stadium WiFi must work. 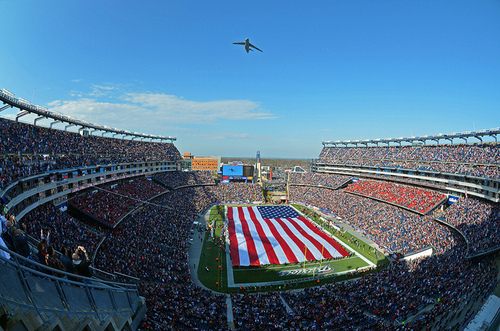 Extreme's first stadium win was Gillette Stadium, home of the five-time Super Bowl Champion New England Patriots. At a customer and media event, team president Jonathan Kraft told the audience that Extreme was the only vendor that was willing to guarantee WiFi performance regardless of capacity. That kicked off Extreme's march through the NFL. Stadium-caliber WiFi is something all businesses should be embracing, as poor WiFi can often lead to failures with digital transformation initiatives. For example, a high-end retailer deployed tablets to all in-store personnel to drive up impulse buys. However, the WiFi network was never upgraded and the user experience was bad, so the staff shelved the tablets. A large hospital deployed a solution to send patient telemetry information to WiFi-enabled clinician devices. A poor WiFi network led to significant latency, so nurses often received messages four to five minutes after alarms were triggered. In healthcare, this can literally mean life or death. Another example is a large school district that implemented tablets as a way of teaching differently. The WiFi network couldn't handle the increase in streaming video and students wasted time reloading videos. The commonality to all these failed projects? Bad WiFi. Automated management. Machine learning is used to monitor and learn the behavior of the RF network. ExtremeAI for Smart OmniEdge software uses artificial intelligence (AI) based analytics to automate the fine tuning of the network. This is critical in verticals like stadiums, healthcare, retail and others, where it's arguable that the wireless network is the business. Programmable radios. Customers can select from three modes of radios to optimize 5GHz coverage and support other types of devices without having to re-cable. Extreme also offers an integrated Bluetooth radio to enhance guest engagement analytics, granular location services and connectivity to IoT devices. Improved security. The latest WiFi security standard, WPA3, is integrated into the APs. This improves cryptographic strength for WiFi networks that transmit sensitive data, such as financial information or patient records. Mobile endpoints, particularly Android devices, are becoming the device of choice for hackers and improved security can help thwart that. In addition to the APs and new features, Extreme announced its new ExtremeSwitching X465 stackable multi-rate Ethernet switch. This switch includes MACsec and 60/90W power over Ethernet. There are six different models of the X465 to meet the needs of different types of wiring closets or branches. The wired infrastructure is key as a beefed-up WiFi network on an old wired LAN will lead to problems where the wired network becomes the choke point. My advice to businesses looking at WiFi 6 is to ensure the wired network has been upgraded first. The boost in performance of WiFi 6 can help enable businesses to use a number of new applications over wireless. This includes 4k video, virtual and augmented reality and a broadening of IoT initiatives. The role of WiFi has changed so much over the past decade. What was once a network of convenience is now the preferred or only network for so many new applications, and WiFi 6 makes the previously impossible possible.